The database consists of the complete run of documents in the series DO 133, DO 134 and FCO 37, as well as all documents covering the Indian subcontinent in the FO 371 series. Events covered include independence and partition, the Indian annexation of Hyderabad and Goa, war between India and Pakistan, tensions and war between India and China, the consolidation of power of the Congress Party in India, military rule in Pakistan, the turbulent independence of Bangladesh and the development of nuclear weapons in the region. 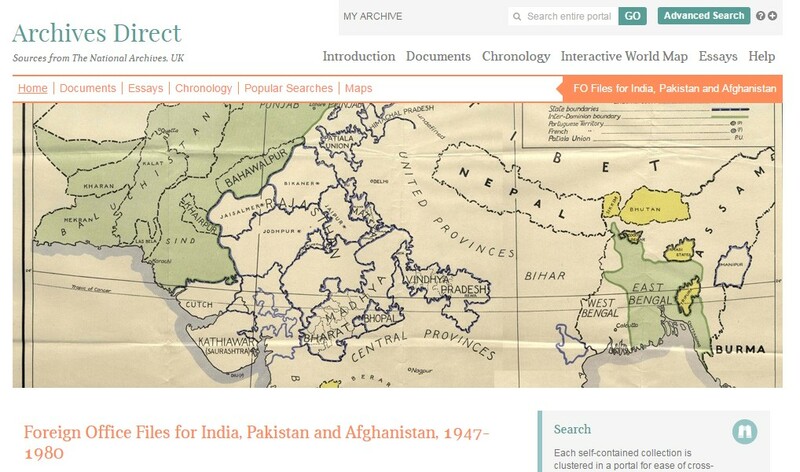 This entry was posted in Library, Online resource, Trial and tagged Afghanistan, Databases, History, India, International Relations, Pakistan, Politics, primary source by cstirling. Bookmark the permalink.